I’ve been struggling to clean up scans to make you some more animated giffs. My brain has not been awesome enough to succeed now that I don’t have a working copy of photoshop. I ended up drawing this in a free downloadable app… only it doesn’t export as a giff the way I assumed it does… so assume it’s a looping giff, cause otherwise the end message will make no sense! And it’s quite possible the recommended links will be random heat exhaustion vlogs from my first trip to America years ago (YEARS I TELL YOU YEARS). The sound quality is terrible, and I’m sure I don’t make sense and possibly say terrible things/don’t make sense. I don’t recommend you watch them. I’m just too technology fatigued to lock them all away as private! I’ve lost most of my graphics software, but my hope is that one day this shall be an animated giff. Here’s the snippet of video that survived Sketchbook crashing twice. I’m sad all the brain storming and mad scribbling got lost. I guess the drawing isn’t terrible, but it is lacking magic and its composition is made of meh. 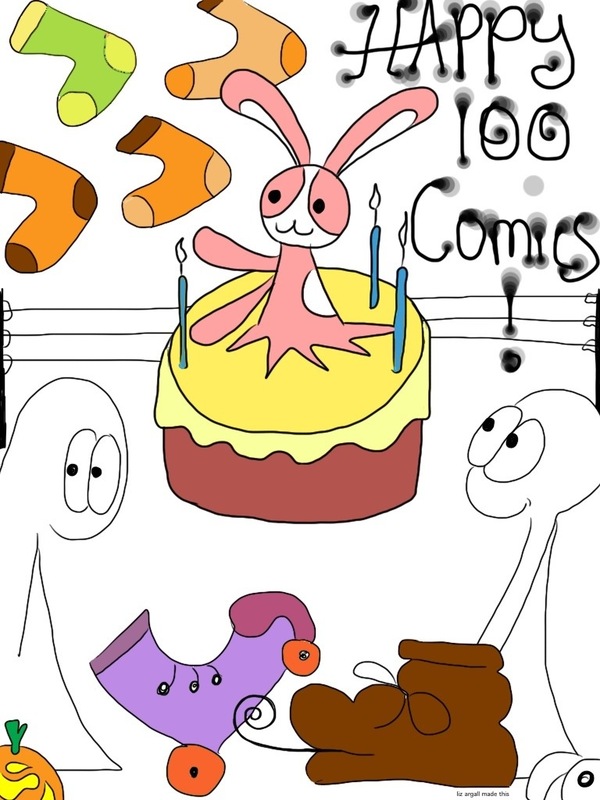 I think the comic I finally came up with for the day was a better spend of 100th comic celebration. I’m glad this drawing was a disappointment and not good enough!